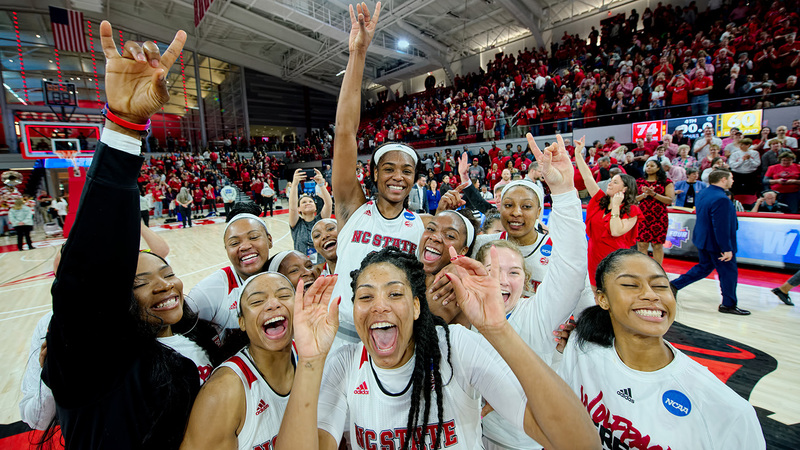 NC State women’s basketball celebrates its second-round NCAA victory over Maryland Sunday at Reynolds Coliseum. Photo by Greg Mintel/NC State athletics. NC State women’s basketball coach Wes Moore has been with the Wolfpack to the NCAA Championship Sweet Sixteen before. Back in 1995, his second year as an assistant under legendary coach Kay Yow, Moore was on the bench when the Wolfpack upset Penn State on its home court to advance to the NCAA East regional semifinals. 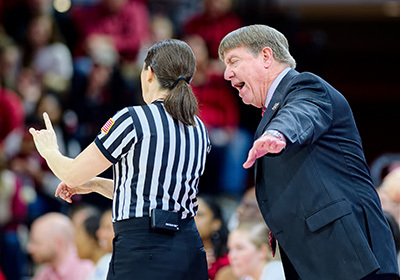 This weekend, Moore will become the second women’s coach in NC State history to take a team to the Sweet Sixteen, when his fourth-seeded squad (26-8 overall) faces top-seeded Mississippi State (34-1) Friday night in Kansas City (7 p.m., ESPN). It’s a team Moore believes would make his former mentor proud. NC State fifth-year coach Wes Moore (right) is the second head coach to take the Wolfpack to the NCAA Sweet Sixteen. 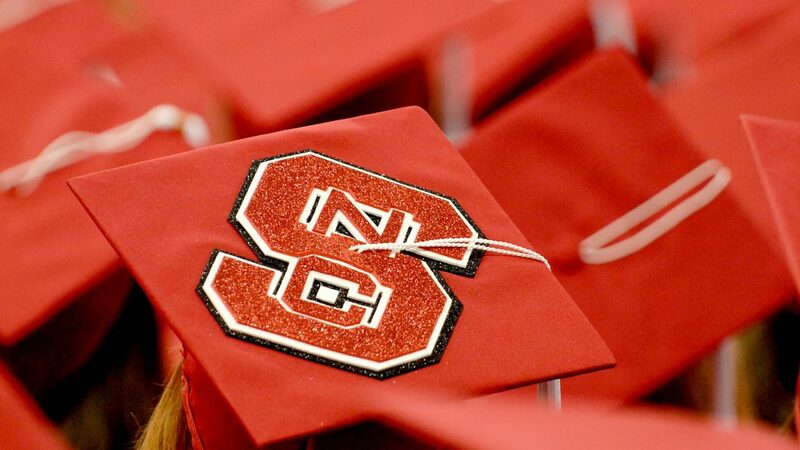 Photo by Greg Mintel/NC State athletics. Picked to finish 10th in the Atlantic Coast Conference after losing four seniors from last year’s 23-9 NCAA tournament team, the expectations were fairly low for the fifth-year coach’s team. Even his boss, athletics director Debbie Yow, thought so. There were times in the fall when Moore agreed with Yow, who is the younger sister of Kay Yow. Guided by the balanced scoring of four players averaging double-digit points, the Wolfpack has won 14 of its last 17 games following a three-game losing streak to start the calendar year. It posted wins over ranked opponents Duke and Florida State and rolled to wins over Elon and Maryland last weekend at Reynolds Coliseum in the first two rounds of the NCAA Tournament. 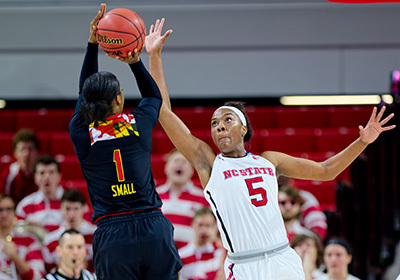 Senior forward Chelsea Nelson leads the Wolfpack in scoring at 13.1 points per game and rebounding at 9.6 per game. Photo by Greg Mintel/NC State athletics. Exceeding low odds and lower expectations was one of the things Yow did best during her 34-year career with the Wolfpack. “I was blessed to be with Coach Yow for a couple of years [1993-95] as an assistant and we went to the Sweet Sixteen my second year,” Moore says. “I think Coach Yow would be really proud of the way they’ve battled all season, the way they’ve overcome adversity. Kay Yow led the Wolfpack to the Sweet Sixteen 12 times in her Hall of Fame coaching career, most recently in 2007, when she courageously returned from a two-month absence from coaching while being treated for breast cancer to lead her team to wins over Robert Morris and Baylor before falling in the regional semifinals to Connecticut. Now, Moore and his squad head to Kansas City, where Yow coached in her only NCAA Final Four in 1998, looking to exceed expectations one more time against the favored Bulldogs, who have lost just once this season.